Chimneys require periodic and timely maintenance. Older chimneys can demand replacement or an upgrade. Even new chimneys require proactive upkeep. Iron Shield Roofing specializes in all kinds of chimney repair services. When the mercury dips and you need an optimally functioning chimney, you can count on our expertise. The secret to impeccable chimney repair is timely inspection, chimney sweeps and the all important preventive maintenance. You should always have your chimney inspected at least once every year. Older chimneys must be inspected twice a year. Damaged masonry is a typical problem with chimneys. The masonry on the roof and inside the firebox has to bear the high heat, parts of it endure direct flames and the entire installation has to deal with the obvious wear & tear over time. As you keep operating the chimney, it would suffer structural and aesthetic damage. While the masonry is designed and meant to endure the high heat and flames, the cycle of freezing and thawing is what takes a toll on the construction. You should not only worry about the soot buildup and the aesthetic degradation but also have the structure checked out. Old or ageing masonry will be more vulnerable to structural issues. You would find unpleasant visible soot, stain buildup and there would be the more discomforting dents and cracks. Chipping and structural deterioration are also typical. The joints would get damaged and you would find loose mortar. The sheet metal that is installed at the rooftop will also get damaged in time. 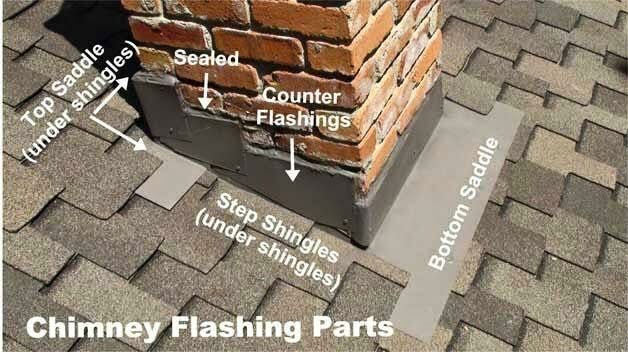 The chimney flashing may break or crack and it can also come apart. The cycle of freezing, heating and subsequent thawing only gets repeated and the problems are further worsened by moisture. Iron Shield Roofing specializes in chimney repair and maintenance. We conduct an extensive inspection to find out the problems and their causes. We inspect everything, from the flashing to the stacks, caps to the collars, we inspect for leaks and any kind of structural damage in the chimney or the roof immediately around the chimney. Our chimney repair and maintenance services include chimney leaks, crown repair and masonry problems. We have an expert team of chimney repair technicians. We also have a customized approach to every chimney repair project because every chimney and roof can be different.